I’m a sucker for parades. I’m not sure why, perhaps as a child I was deprived of parades. Who knows? This year’s parade was being billed as more classy and modern than previous years. Seemed very similar to previous years and I reckon none of them were as good as 2002’s Moomba Parade which involved actual trams being decorated in various designs. Still, I think this year entertained sheerly for the amount of random groups. OK, you have the various schools, makes sense. Dance companies, sure why not. Various cultural groups (Turks, Chinese), still good. Then came religious groups, Hare Krishnas followed by Buddhists. OK, random but sure why not. Then came the Austrek Star Trek Fans group consisting of 6 or so of the nerdiest trekkies dressed in uniforms. What the? Although to be fair, each of them wore a uniform consisting of a different series/rank. At that point, I think everyone concluded that any group can be accepted into the parade. 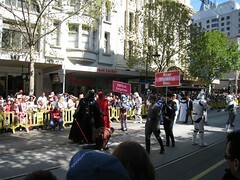 After that, two groups called the 501st Legion and Star Walking Inc. followed and everyone bowed down to Lord Vader. If you didn’t the army of storm troopers following him would make you. Alright, maybe not but very entertaining. How bout Aussie bloggers for next year’s parade? I do admit I’d love to dress up in a Star Trek uniform. Other highlights were the natural bodybuilders and Melbourne Taxi Drivers. The taxi drivers were a bit odd and perhaps they needed some taxi props. Star Wars people had a sword fight, bodybuilders flexed, the taxi drivers sort of jived around. I don’t see any instuctions on the thatsmelbourne site for how to enter parade but I’ll definitely have to remind myself next year to look it up. What would a group of Melbourne bloggers do though? Play with our keyboards?